We have examined the effects of aqueous complexation on rates of dissimilatory reductive precipitation of uranium by Shewanella putrefaciens. Uranium(VI) was supplied as sole terminal electron acceptor to Shewanella putrefaciens (strain 200R) in defined laboratory media under strictly anaerobic conditions. Media were amended with different multidentate organic acids, and experiments were performed at different U(VI) and ligand concentrations. Organic acids used as complexing agents were oxalic, malonic, succinic, glutaric, adipic, pimelic, maleic, citric, and nitrilotriacetic acids, tiron, EDTA, and Aldrich humic acid. Reductive precipitation of U(VI), resulting in removal of insoluble amorphous UO2 from solution, was measured as a function of time by determination of total dissolved U. Reductive precipitation was measured, rather than net U(VI) reduction to U(IV), to assess overall U removal rates from solution, which may be used to gauge the influence of chelation on microbial U mineralization. Initial linear rates of U reductive precipitation were found to correlate with stability constants of 1:1 aqueous U(VI):ligand and U(IV):ligand complexes. In the presence of strongly complexing ligands (e.g., NTA, Tiron, EDTA), UO2 precipitation did not occur. Our results are consistent with ligand-retarded precipitation of UO2, which is analogous to ligand-assisted solid phase dissolution but in reverse: ligand exchange with the U4+ aquo cation acts as a rate-limiting reaction moderating coordination of water molecules with U4+, which is a necessary step in UO2 precipitation. Ligand exchange kinetics governing dissociation rates of ligands from U(VI)-organic complexes may also influence overall UO2 production rates, although the magnitude of this effect is unclear relative to the effects of U(IV)-organic complexation. Our results indicate that natural microbial-aqueous systems containing abundant organic matter can inhibit the formation of biogenic amorphous UO2. Uranium (U) is a prominent environmental radiocontaminant at a local to regional scale throughout much of the developed world. Most historic releases of U into natural aquatic systems have occurred through the agencies of U mining, ore processing, isotopic separation, and waste disposal related to the production of fission weapons, and the operation of commercial nuclear reactors. Other major sources of environmental U dispersal include coal combustion, releasing U through fly ash or stack emissions, and the military use of 235U-depleted U(IV) oxide in kinetic penetrators. Reduction of soluble U(VI) to relatively insoluble U(IV) may serve as one potential method, under anoxic conditions, of removing uranium from the aqueous phase, or of sequestering uranium adsorbed onto organic or mineral surfaces. Uranium(IV) is sparingly soluble, and will tend to precipitate forming amorphous UO2(s). Abiotic methods exploiting U(VI) reduction as a means of U removal from groundwater have been approached, including permeable groundwater barriers incorporating zero-valent iron or sodium dithionite as reducing agents. [16–18] These methods seek to isolate U from the biotic environment through chemical reductive precipitation, and could presumably offer a more permanent remedial solution than sedimentary U(VI) adsorption, which would be vulnerable to reversibility via shifts in groundwater pH (e.g., industrial acidification) or ionic strength (e.g., salt water intrusion). Bacterial dissimilatory U(VI) reduction, leading to U(IV) precipitation as UO2(am), has been proposed as an alternative means of promoting U mineralization under industrial or in situ environmental conditions. Diverse bacteria are capable of dissimilatory U(VI) reduction, in many cases obtaining energy for growth by coupling U(VI) reduction to the oxidation of organic carbon or H2. [20, 21] Bacteria such as Shewanella putrefaciens,[22, 23]Geobacter metallireducens and G. sulfurreducens[24–26] are capable of employing U(VI) as sole terminal electron acceptor (TEA), coupled with use of organic carbon or H2 as electron donor. Other bacterial groups capable of dissimilatory U(VI) reduction include Desulfovibrio [27–32]Pseudomonas, [23, 33]Thermus, and some halophilic Archaea, although many bacteria are not apparently capable of growth using U(VI) as sole terminal electron acceptor. Previous studies have examined the influence of aqueous organic complexation on U(VI) bioreduction by S. putrefaciens and D. desulfuricans[36, 37] and report that high concentrations of strongly chelating organic ligands can have an appreciable effect on the rate of U(VI) reduction and precipitation by bacteria. Ligands that weakly complex U(VI), such as acetate, result in overall U(VI) reductive precipitation rates similar to control media containing unchelated U(VI), whereas strongly chelating ligands, such as oxalate, citrate, or tiron (4,5-dihydroxy-l,2-benzene disulfonic acid) tend to retard microbial U(VI) reduction. However, most previous studies[36, 38, 37] do not offer predictive estimates of U removal rates, therefore it is difficult to extend the available data to diverse geochemical conditions. Haas and DiChristina report a systematic relationship between the equilibrium stabilities of aqueous organic Fe(III) complexes and rates of microbial dissimilatory Fe(III) reduction by S. putrefaciens under laboratory conditions. These results demonstrate that competitive coordination reactions, involving aqueous ligands and enzymatic coordination sites at the bacteria–water interface, can govern the bioavailability of Fe(III) in a systematic and predictive fashion. It is unknown if similar relationships hold with respect to U(VI). Uranium in waste from industrial isotopic separations, or in spent nuclear fuel, is often accompanied by high concentrations of organic ligands (e.g. EDTA) used in cleansing of machine components. [33, 40] Concentrations of EDTA up to 5876 μg/g have been reported in the aqueous phase of Han-ford mixed high-level nuclear waste, along with 5965 μg/g citric acid, 591 μg/g oxalic acid, and 260 μg/g NTA. Thus, understanding the effects of organic chelation on microbial U(VI) reductive precipitation is crucial in forecasting the efficacy of proposed bioremedial designs, and in predicting the long-term fate and transport of existing and future U ground-water contamination. In the present study we examine the effects of aqueous organic complexation on rates of U(VI) reductive precipitation by S. putrefaciens under controlled laboratory conditions. A suite of low molecular weight polycarboxylic acids and one polysulfonic acid were selected, including maleic acid, citric acid, nitrilotriacetic acid (NTA), 4,5-dihydroxy-1,3-benzene-disulfonic acid (tiron), ethylenediaminetetraacetic acid (EDTA) and saturated aliphatic dicarboxylic ligands of carbon number two to seven (oxalic, malonic, succinic, glutaric, adipic, and pimelic acids). These particular acids were chosen to systematically examine speciation effects on U precipitation rates, as a function of chelate ring size and aqueous U(VI) complex stability. Aldrich humic acid was used as a natural organic matter (NOM) analog, and to compare with data obtained from low molecular-weight ligands. Rates of U reductive precipitation, as UO2(am), were measured in media containing different initial U(VI)-organic aqueous complexes. Experimental rates were considered alongside properties of U(VI) and U(IV) organic complexes, to develop a generalized and predictive understanding of aqueous chelation effects on U biomineralization. S. putrefaciens (strain 200R) was used in this study. Bacteria of the genus Shewanella are widely recognized and used in biogeochemical research as model bacteria for examining dissimilatory metal reduction., see e.g., Refs. [42–46, 21, 39, 2, 22, 47]. S. putrefaciens is a versatile, facultatively aerobic, Gram-negative metal-reducing bacterium, capable of obtaining energy for growth using Fe(III), Mn(IV), U(VI), , , Cr(VI), Tc(VII) and fumarate, each as sole TEA. [22, 48–51] In this study cultures were prepared from frozen glycerol-treated stock maintained at -80°C, transferred to agar plates of Luria–Bertani (LB) media, and cultured at 30°C aerobically for at least 24 h prior to use. Single colonies from viable, growing LB-agar plates were transferred to sterile liquid LB media and cultivated in 50 mL volumes aerobically at 30°C in a heated, shaking environmental chamber for 24 h. These cultures, harvested at mid-exponential phase, were used as inocula for U(VI) reduction experiments. Initial cell density in all experiments was approximately 109 cells/mL. Surveys of subsurface aquifers report microbial populations on the order of 105–108 cells/cm3, and even higher populations in eutrophic surface waters. [52–54] The relatively high cell density used in the experiments, relative to subsurface natural conditions, was adopted to facilitate rapid U(VI) reduction kinetics that would allow experiments of shorter duration. This was done to minimize potential cell lysis problems associated with lengthy batch cultivations. Active aerobically grown cultures of S. putrefaciens were transferred to a Coy® glove box anaerobic chamber and degassed with recirculated interior atmosphere (95%N2/5%H2) for 15 min prior to inoculation to remove dissolved oxygen from growth media. Experiments were carried out in 50 mL sterile polypropylene centrifuge tubes, into each of which was introduced 50 mL of sterile experimental growth medium and 100 μL of inoculant. Sterile experimental media were allowed to equilibrate in the anaerobic chamber at 30°C for 24 h prior to inoculation. Bacteria were washed twice in sterile anoxic 0.1 M NaCl prior to inoculation into experimental media. Experimental media consisted of a minimal basal salts solution modified from Lovely et al. to exclude phosphate and bicarbonate, but to include dissolved uranyl acetate (1 mM to 10 μM) and selected chelating ligands (200 to 20 mM). The common media composition was (per L): NH4Cl 0.25 g, KC1 0.1 g, Na-lactate (60% syrup) 5 mL, Sigma® RPMI-1640 vitamins solution 0.1 mL, trace elements as per Lovely et al., and adjusted to pH 7 using sterile trace metal grade NaOH and HC1. Additional pH buffering agents were excluded to avoid potential interferences due to complexation of buffer species with U(VI). All experimental media were prepared from reagent-grade materials, autoclaved or filter-sterilized (0.2 μm), and degassed inside the anaerobic chamber to remove dissolved oxygen. The anaerobic chamber was thermostated at 30°C throughout all experiments. Trials were carried out in parallel sets of 50 mL polypropylene reaction vessels, each containing a specific U(VI)-ligand combination, each set inoculated from the same source culture, and incubated under gentle agitation on a rocking stage inside the anaerobic chamber. Ligands selected for this study include a set of compounds broadly representing low molecular weight organic acids in natural systems, as well as some organic contaminants found with anthropogenic U contamination. These include six saturated dicarboxylic acids of carbon number two to seven: oxalic, malonic, succinic, glutaric, adipic and pimelic acids. Experiments also examined maleic acid (an unsaturated aliphatic dicarboxylic acid), citric acid (a saturated aliphatic dicarboxylic, monohydroxylic acid), NTA (saturated aliphatic tricarboxylic acid), tiron (an aromatic disulfonic acid), and EDTA (an aliphatic tetracarboxylic acid). Humic acid (Aldrich) was also used to compare the effects of refractory NOM with those of low molecular weight organic ligands. Concentrations of U(VI) and organic ligands were tailored to ensure that U(VI)-ligand complexes (of varying stoichiometry) dominated the speciation of U in all trials. The aqueous speciation of U in experimental media was calculated using the algorithm JCHESS and its associated database, together with values for U(VI)-ligand and U(IV)-ligand complexation stability constants derived from the literature,[57, 58] and corrected where necessary to infinite dilution. Speciation calculations accounted for complexation of U(VI) with inorganic (e.g., hydroxide, chloride) and organic components (lactate, added ligand) present in the experimental media at their appropriate concentrations, organic acid dissociation reactions, and complexation equilibria involving pertinent aqueous cations and inorganic anions. Ion activity coefficients were accounted for using the extended Debye–Huckel model. Aqueous complexation of U(IV) with strongly chelating organic ligands can result in stabilization of dissolved U(IV), however a lack of reliable stability constants for U(IV) complexation prevents a quantitative estimation of the precise magnitude of this phenomenon in the current study. Fujiwara et al. and Allard et al. provide equilibrium constants for U(IV) hydrolysis, and the compilation of Smith et al. provides data for U(IV) complexation with some organic ligands at elevated ionic strength. [61, 62] However, there is a general paucity of literature values for U(IV) aqueous complexation. 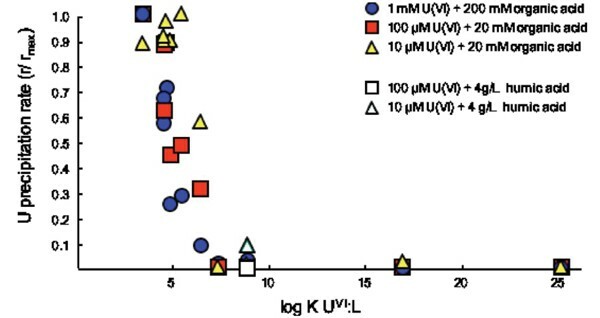 As a result, it is difficult to assess quantitatively the combined impacts of U(VI) aqueous complexation and U(IV) complexation on bulk U mineralization in a microbial-aqueous context. This is one motivation for the current project, which seeks to evaluate the combined influence of both processes on U(VI) reductive removal from solution. Further work is required to quantify the stabilities of U(IV)organic complexes generally, but that work is beyond the intended scope of the present study. Uranium(VI)-ligand aqueous complexes accounted for at least 99% of dissolved U in each solution at each set of concentration conditions employed in this study. In all cases the predominant form of dissolved U in the experimental media was an aqueous complex of U(VI) with the appropriate added ligand. Lactic acid was present in all experiments as a bacterial carbon source, but does not strongly complex with U(VI) in comparison with other ligands used in this study, and under none of the experimental conditions other than the inoculated control were U(VI)-lactate complexes expected to account for a significant fraction of dissolved U(VI). At time intervals throughout the experiments, samples were extracted from reaction vessels and total dissolved U analyzed using ICP-MS. Samples were taken via syringe at time intervals throughout each experiment, immediately filtered inside the anaerobic chamber to 0.2 μm using a fresh 5 mL disposable syringe and nylon syringe filter, and stabilized by addition of trace metal grade HNO3. Microbial U(VI) reduction can result in formation of nanoparticulate UO2(am), which could potentially pass a 0.2 μm filter. For this reason both filtration (0.2 μm) and ultracentrifugation (14000 rpm for 30 min in a microcentrifuge) were tested in this study. Both methods yielded similar results (data not shown). Acid-stabilized filtered samples were analyzed by ICP-MS, using Dy as an internal standard, and calibrated against U standards spanning the experimental concentration range. Ten replicate analyses of U were performed during each analysis, which for most samples provided approximately ± 0.5% analytical relative standard deviation. Overall uncertainty for most experiments is estimated to be ~5 % including analytical and sampling errors. For experiments involving humic acid, sampling and filtration uncertainty is larger (~15%), based on replicate sample determinations. Figures 1, 2, and 3 illustrate the results of experiments in which S. putrefaciens was cultured in the presence of dissolved U(VI) and different organic ligands, each figure showing results at different ligand/metal concentrations. Each diagram presents data for dissolved U concentrations in experimental media as a function of time in hours, and includes data representing an inoculated control trial containing only lactate as a bacterial carbon source, but no additional chelating ligands. Sterile control trials were conducted separately, and showed no evidence of UO2(am) precipitation after 30 days, the maximum period tested in this study (data not shown). 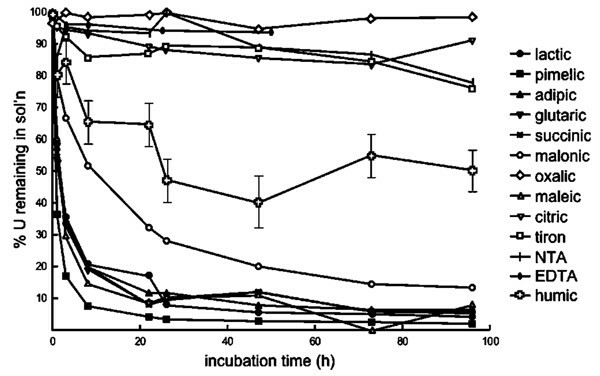 Reductive removal of aqueous U as a function of time in contact with S. putrefaciens bacteria, at 10 μM initial U(VI) and 20 mM organic acid or 4 g/L humic acid. Analytical and sampling uncertainty is ~5% for all trials other than humic acid. Error bars for humic acid estimate uncertainty based on replicate analyses. 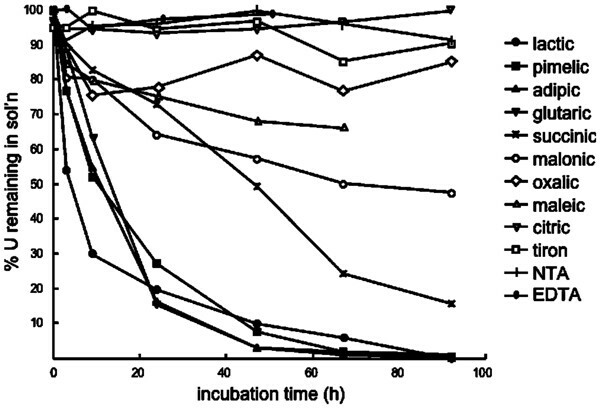 Reductive removal of aqueous U as a function of time in contact with S. putrefaciens bacteria, at 100 μM initial U(VI) and 20 mM organic acid or 4 g/L humic acid. Analytical and sampling uncertainty is ~5 % for all trials other than humic acid. Error bars for humic acid estimate uncertainty based on replicate analyses. Reductive removal of aqueous U as a function of time in contact with S. putrefaciens bacteria, at 1 mM initial U(VI) and 200 mM organic acid. Analytical and sampling uncertainty is ~5% for all trials. Figure 1 shows data for U(VI) reduction experiments in which total available U was 10 μM and total available ligand was 20 mM. For humic acid, 0.2 g/50 mL were used. 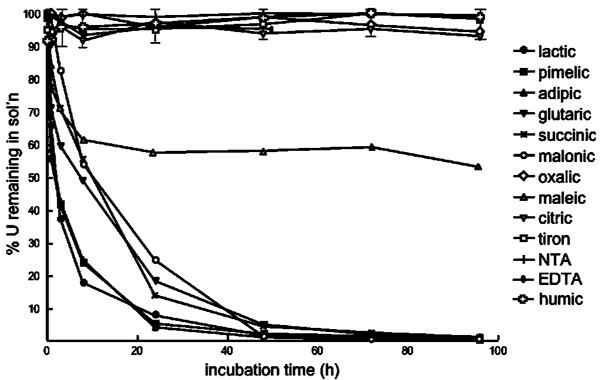 The inoculated control trial shows rapid loss of U from the aqueous phase, as U(VI) is reduced by the bacteria to U(IV) and precipitated as UO2(am). Production of solid UO2(am) was visually evident in this and succeeding experiments by the appearance of a black precipitate. At an initial U(VI) concentration of 10 μM U, little black precipitate was evident in bulk solution, but the solid became visually apparent when it accumulated on filter membranes during sample filtration. In Fig. 1 the inoculated control trial demonstrates that, in the absence of additional U-chelating ligands, U reductive removal is rapid, removing ~95% of available U from solution after approximately 48 h. From 48 h to the maximum sampling period of 96 h, little additional U precipitation was evident. The rate of UO2(am) precipitation in the inoculated control trial was essentially linear with time for the first 3 h of the experiment, after which the rate diminished asymptotically. These results are similar to those reported previously in studies of microbial U reductive precipitation – see e.g., Ref. . Trials with several other ligands display behavior similar to the inoculated control. Curves for pimelic, adipic, glutaric, succinic, and maleic acids are broadly similar in shape to that of the inoculated control. In contrast, the data for malonate show slower overall U(VI) reductive removal, and even slower rates for humic acid. Values for malonic acid and humic acid further demonstrate that U(VI) reductive removal, up to 96 h, does not proceed to the extent of completion observed for the control (and many other ligands). Approximately 15% of available U(VI) remains in solution at the end of 96 h in the presence of 20 mM malonic acid, while half of the available U(VI) remains in solution in the presence of 4 g/L humic acid. Citric acid, oxalic acid, and NTA do not show clear evidence of any U removal, although data at 96 h for NTA show lower concentrations that may indicate incipient partial U removal. Similar results are obtained from experiments in which the concentration of initial U(VI) is increased to 100 μM, maintaining ligand concentrations at 20 mM (or 4 g/L humic acid). Under these conditions, experimental data (shown in Fig. 2) show rapid U precipitation in the inoculated control, with similarly rapid U precipitation in trials containing pimelic and adipic acids. In trials containing glutaric, succinic, and malonic acids, U precipitation rates are marginally slower, while maleic acid appears to allow initially rapid reduction but ultimately stalls at ~50% of initial U(VI) remaining in solution. For oxalic acid, citric acid, NTA, and humic acid, no measurable U removal is observed up to 96 h.
At 1 mM available U(VI) and 200 mM ligand, results broadly follow the above-observed patterns, but with some significant differences (Fig. 3). The inoculated control and trials containing pimelic, adipic, and glutaric acids exhibit rapid reduction of U(VI), leaving less than 1% of available U in solution at the end of 96 h. Trials containing succinic, malonic, and maleic acids show UO2(am) precipitation at initial rates that are slower than the inoculated control. Both malonic and maleic acids limit the extent of overall U removal to about 35%–50% by the end of the experiment. Oxalic acid trials possibly show some initial U removal, although after 9 h little additional U removal occurs, leaving ~85% of initial U in solution at the end of 96 h. No U precipitation is observed in trials containing citric acid or NTA. In general, the experimental results demonstrate that the presence of organic chelating ligands can significantly influence the rate of microbial U(VI) reductive removal, depending on ligand type and concentration. Some ligands, such as pimelate, adipate, glutarate and succinate, did not significantly retard the rate of UO2(am) precipitation by S. putrefaciens, while the ligands maleate, malonate, and oxalate curtailed UO2(am) formation, and in some cases appeared to arrest this process prior to completion. Strongly chelating ligands, such as citrate or NTA, and including Aldrich humic acid, appeared to effectively prohibit UO2(am) formation by S. putrefaciens. The observed effects of aqueous U chelation on UO2(am) production rates likely derive from a combination of (1) aqueous complexation of initial uranyl with organic ligands, and (2) aqueous organic complexation of U(IV) produced by microbial catalysis of uranyl reduction. To quantify the influence of aqueous complexation reactions on U reductive removal, initial linear U removal rates were obtained from experimental data shown in Figs. 1, 2, 3, using only those initial portions of ligand-specific trends that could be best approximated as linear. For most trials UO2(am) precipitation rates could be approximated as linear within the first 8–9 h of each experiment, when electron donor and acceptor concentrations were not limiting. Uranium removal rates further into experiments were slower, consistent with expectations based on Michaelis – Menten kinetics. Initial U removal rates correlated with initial U(VI) concentration, as shown in Fig. 4, which shows results for inoculated control experiments containing no added ligands beyond lactate. Initial U removal rates are linear in initial U(VI) concentration, indicating that the maximum Michaelis-Menten U(VI) conversion rate was not approached in the experiments, where the maximum initial U(VI) concentration was 1 mM. Thus, U reductive removal rates measured in ligand-amended media – which were slower than rates in control media – were not constrained relative to each other by the ceiling imposed by the maximum enzymatic turnover rate. It is therefore expected that variations among rates in different media result principally from U speciation effects, and not the bacterial processing rate for U(VI). (Color) Initial U reductive removal rates in lactic acid trials (inoculated controls) as a function of initial U(VI) concentration. Line represents a best-fit linear regression of the data. 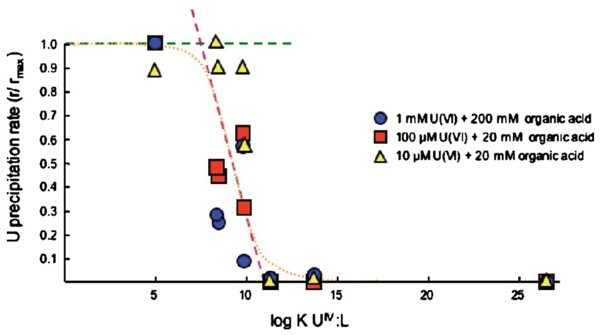 Absorption of U(VI) onto bacterial surfaces was not a significant sink for U during experiments, and is not likely to have contributed measurably to removal of U from solution during trials. Using experimental equilibrium constants for U(VI) adsorption onto S. putrefaciens, along with data for media solute and cell concentrations, calculations conducted using a constant capacitance model and the speciation algorithm JCHESS indicate that even at the lowest U concentration employed in experiments, 10 μM U, less than 0.1% of available U adsorbs onto the bacterial surfaces. Thus, removal of U during experiments can be attributed primarily to reductive precipitation of UO2(am), and not to adsorption onto bacterial cell membranes. Previous work examining dissimilatory Fe(III) reduction by S. putrefaciens demonstrates that, under laboratory conditions in pure culture, initial Fe(III) bioreduction rates depend strongly on the stability constant of the relevant 1:1 aqueous Fe(III)-organic complex. This relationship was observed even under conditions where the predominant Fe(III) aqueous species was a higher-order (i.e., 1:2, 1:3 cation:ligand) complex. It was interpreted from this observation that, under conditions where aqueous ligands and bacterial coordination sites compete for available dissolved Fe(III), the rate-limiting step constraining Fe(III) coordination with the bacterial surface is the leaving rate of the last conjoined ligand of an aqueous Fe(III)-organic complex. This leaving rate is equivalent to the rate of ligand exchange from the cation:ligand complex, which under isothermal conditions where one cation is considered, is dependent primarily on the equilibrium stability constant. A similar relationship is observed in the present study with respect to U(VI); in Fig. 5, initial linear U precipitation rates are compared with stability constants for aqueous U(VI)-organic 1:1 complexes. Rates shown in Fig. 5 are normalized to the maximum rate for each U(VI): ligand concentration condition. (Color) Equilibrium formation constants for aqueous U(VI):ligand complexes, plotted vs initial linear U reductive precipitation rates from experiments. Rates are normalized to the maximum rate from each set of results at constant U:organic acid concentrations. An alternative explanation for the trends observed in Figs. 1, 2, 3 could involve chelation of the added ligands not with U(VI), but with U(IV). Stable aqueous complexation of U(IV) would tend to raise the solubility of UO2(am) by diminishing the equilibrium activity of the aquo U4+ cation. A result would be retention of U in solution, despite successful reduction of U(VI) to U(IV) by the bacteria. This mechanism would, for example, undermine bioremedial efforts that hinge on UO2(am) formation. It might also inhibit the formation of uraninite ore bodies in subsurface settings where microbial activity is the principal mediator of ore formation. High activities of dissolved organic matter, in such a situation, would retard U mineralization, potentially acting as a feedback limitation on microbially promoted uraninite ore accumulation. This hypothesis is supported by Ganesh et al and Robinson et al. who report aqueous U(VI) reduction by S. putrefaciens and D. desulfuricans in laboratory cultures in the presence of citric acid and tiron, but little to no UO2(am) precipitation. A quantitative assessment of the dependence of U reductive precipitation rates on the stability of U(IV)-organic complexes is problematic, however, due to the general paucity of reliable U(IV) aqueous-complexation equilibrium constants in the literature. 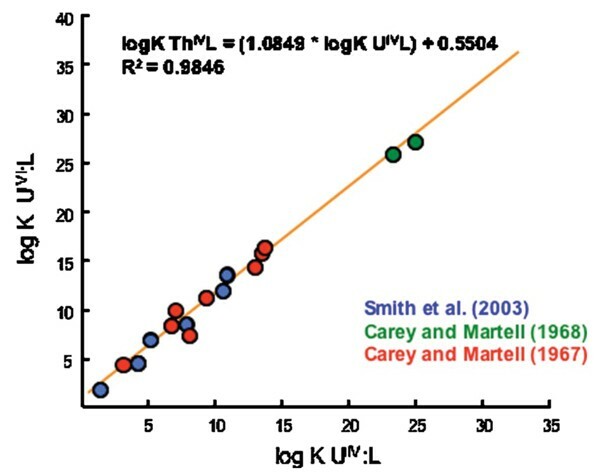 Experimental data for U(IV) aqueous complexation with lactic acid are provided in the critical review and compilation of Smith et al but only at an ionic strength of 1.0 M. Carey and Martell provide data for U(IV) complexation with EDTA and CDTA, while Carey and Martell provide data for mixed organic-ligand complexes with U(IV). More data are available for Th(IV) complexation with organic ligands (referenced in Smith et al.). Thermodynamic data for Th(IV) complexation were used in this study to estimate complexation stability constants for U(IV) complexation, using a linear free energy correlation. Figure 6 illustrates a covariation between aqueous complex-formation equilibrium constants for Th(IV) and U(IV), where each value corresponds to the logarithm of the first-order formation constant of a respective cation:ligand aqueous complex. Values in Fig. 6 are taken from the literature[57, 61, 62] and are uncorrected for ionic strength, on the basis that activity coefficient terms correcting Th(IV)-ligand and U(IV)-ligand equilibrium constants to infinite dilution, where cation, ligand, and complex charges are constant with respect to each Th/U pair of data, are identical, resulting only in displacement of values along the observed trend. The trend in Fig. 6 was used to predict values for U(IV) complexation constants for oxalic, malonic, succinic, maleic, glutaric and citric acids. These predicted values, along with literature values for U(IV) complexation with EDTA and lactic acid, corrected to infinite dilution are compared with rate data in Fig. 7. (Color) Published values for U(VI):ligand aqueous complexation constants, plotted vs corresponding values for U(IV):ligand complexation. Data from each reference are color coded. The solid line represents a best-fit linear correlation of the data. (Color) Equilibrium formation constants for aqueous U(IV):ligand complexes, plotted vs initial linear U reductive precipitation rates from experiments. Rates are normalized to the maximum rate from each set of results at constant U:organic acid concentrations. The dashed and dotted lines denote potential constraints on UO2 precipitation rates, and are discussed in the narrative. In Fig. 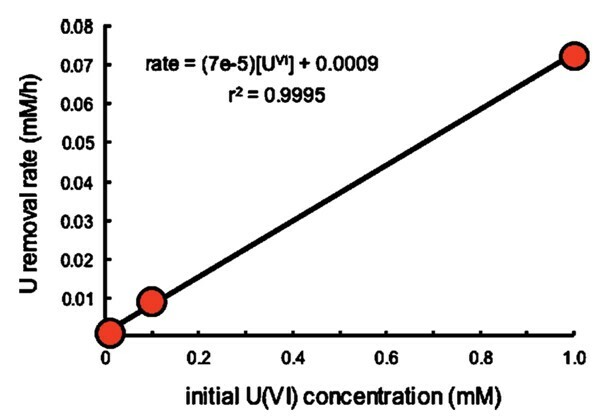 7 formation constants for 1:1 U(IV)-ligand aqueous complexes are plotted against UO2(am) formation rates normalized to initial U(VI) concentration. Figure 7 is similar in structure to Fig. 5, and shows a similar trend with respect to the dependence of UO2(am) formation rates on U complexation. In Fig. 7, rates are seen to vary in a systematic fashion with the stability of U(IV) complexation, with weak U(IV) complexation promoting more rapid U reductive precipitation, strongly stable U(IV) complexation preventing UO2(am) formation, and intermediate values of U(IV):L formation constants correlating negatively with UO2(am) formation rates. The trends shown in Figs. 5 and 7 are similar, likely due to the correlative complexation behavior of high field-strength cations such as U(VI) and U(IV), with respect to an equivalent set of ligands (e.g., Refs. and ). The trend observed in Fig. 7 supports a model of ligand-retarded precipitation of UO2(am). This interpretation is theoretically consistent with expectations based on previous work describing ligand-assisted dissolution of metal-oxide phases. For example, Ludwig et al. [67, 68] report experimental results for ligand-assisted dissolution of bunsenite (NiO), showing a positive linear correlation between the stability of aqueous Ni:L organic complexes and measured NiO dissolution rates. This relationship arises due to mediation of water exchange with solid-phase or aqueous cations and a coordinating ligand. An inverse of this process would be expected to occur with respect to solid phase precipitation under supersaturated conditions: strong ligand coordination with aqueous cations should retard the rate of precipitation, resulting in a negative slope on a log KML (equilibrium formation constant of a metal:ligand complex) versus rprecip (initial linear rate of precipitation) diagram. This relationship is observed in Fig. 7. Rates of UO2(am) precipitation drop to zero in the presence of strongly chelating ligands, and this result would be anticipated under conditions where rates are either immeasurably slow, or where the solution is no longer saturated with U(IV). The latter possibility is difficult to ascertain, because of the paucity of reliable values for U(IV) aqueous complexation constants. For weakly complexing ligands, UO2(am) precipitation rates would be expected to increase as a linear function of decreasing values for log KML, however the precipitation rate will not exceed the maximum rate imposed by the rate of bacterial U(VI) to U(IV) turnover, which is itself a function of intrinsic Michaelis-Menten kinetics, and is also likely to depend on U(VI) speciation. These envisaged constraints on UO2(am) precipitation rates are shown qualitatively in Fig. 7, as (1) a sloping dashed line, denoting the effect of ligand-retardation on precipitation rates, (2) a horizontal dashed line, denoting the maximum rate of bacterial U(VI) conversion, (3) the x axis at an intercept of 0 along the y axis, denoting a rate of zero under conditions of likely UO2(am) undersaturation, and (4) the dotted curve which interpolates a smooth relationship bounded by constraints (1) through (3). It is significant that (Aldrich) humic acid was found in this study to suppress dissimilatory UO2(am) precipitation rates. Gu and Chen found that polycondensed aromatic humic materials can enhance the rate of microbial dissimilatory U(VI) reduction, presumably by functioning as effective electron shuttles. Although some humic substances may prove effective at promoting electron delivery to U(VI) from bacteria, our results suggest that humics can also suppress UO2(am) production via ligand-retarded precipitation. In Fig. 5, U removal rates in the presence of (Aldrich) humic acid are plotted using literature values for 1:1 U(VI):humic complexation. Corresponding values for U(IV) complexation with humic acid are unavailable, but because the trends in Figs. 5 and 7 are similar, U(VI) complexation constants can suffice as an approximation. Values from Lenhart et al. were adjusted to neutrality using the pH dependence of the original data, and approximated to infinite dilution using Debye – Huckel parameters assuming the ligand charge behavior of citric acid, yielding a conditional logK (1:1) for U(VI):humic acid of ~9. Using this approach, humic acid falls on the same overall trend as other low molecular weight organic acids. This result suggests that natural waters containing high concentrations of dissolved NOM could effectively suppress microbial UO2(am) formation. This observation is consistent with field data showing no apparent U(IV) precipitation in naturally U-enriched freshwater peat bog sediments. In contrast, marine sediments commonly show evidence for U reductive mineralization as a function of increasing sediment depth. [30, 71–77] This may occur due to weaker U(VI) or U(IV) complexation with fulvic acids in marine sediments where organic matter degradation is more complete, or may be due to an intrinsic difference in the U(VI) reductive capabilities of the respective microbial flora in each setting. Further studies investigating the effects of NOM complexation on microbial dissimilatory UO2(am) production would be required to better assess these possibilities. At present a quantitative extrapolation of the experimental results to field conditions is problematic, because of (1) limited data describing U(IV) aqueous complexation and solubility, (2) an incomplete understanding of the effects of U(VI) aqueous speciation on dissimilatory U(VI) reduction rates, and (3) an almost complete lack of information on ligand-impacted dissolution and precipitation rates for bio-genie UO2(am). The experimental data suggest that under natural conditions where chelating organic ligands are abundant, production of UO2(am) is constrained by ligand complexation with dissolved U(IV). Aqueous U(VI) complexation will also tend to impact rates of dissimilatory U(VI) reduction, however, and the combination of these two largely unqualified processes is likely to complexly govern U biogeochemical speciation in natural settings. Further work is required to assess these factors. This research was supported by funds provided by Western Michigan University. Our work benefited greatly from many helpful discussions with Carla Koretsky, Charlie Moore, David Fowle, and Tom DiChristina. Technical assistance was provided by Nancy Morgan. This is contribution number 4 of the Microbial Aqueous Geochemistry, Bio-geochemistry and Thermodynamics (MAGBAT) laboratory at WMU.